Withdrawals from the vaults of the Shanghai Gold Exchange (SGE), our measure of Chinese wholesale gold demand, accounted for 43 tonnes in week 47 (spanning from 30 November until 4 December). 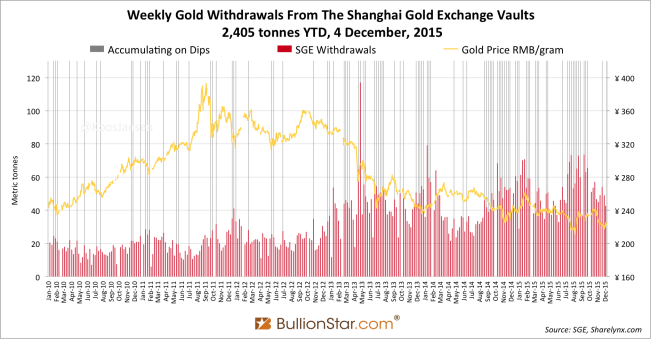 Year to date SGE withdrawals have reached 2,405 tonnes. 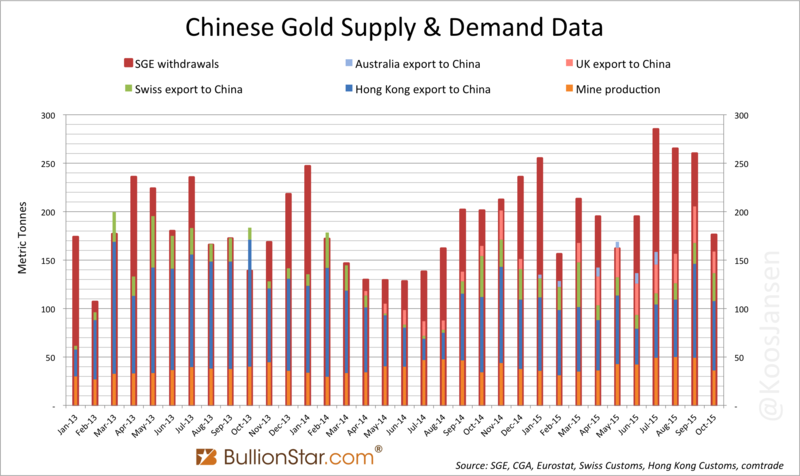 SGE withdrawals in 2015 have broken every record, though Chinese (consumer) gold demand is not likely to transcend that of 2013. This is possible because of different metrics used to measure Chinese gold demand. 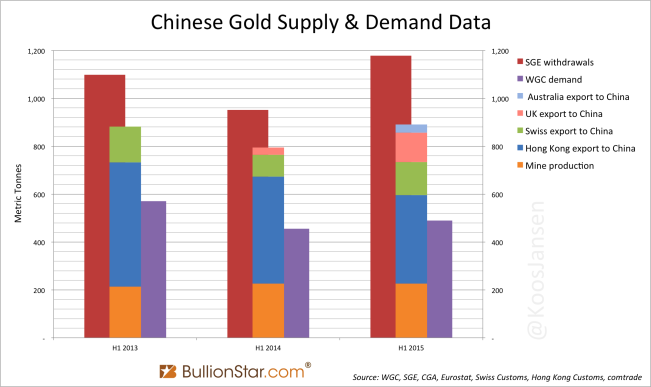 Quite often I’ve written on these pages about the difference between SGE withdrawals and Chinese consumer gold demand as disclosed by the World Gold Council (WGC). SGE withdrawals, for example, capture a wider flow of scrap supply that enters the vaults, and the matching demand pulling it out. Next to the fact the lion share of the difference is a result of direct purchases by individual and institutional investors at the SGE, I would say gold-for-gold cycles through the SGE form the next most significant reason that causes the difference. So, although Chinese gold import this year is set to reach 1,400 tonnes – and total supply is again to double demand as disclosed by the WGC – we must also focus on how much recycled gold is supplied to the SGE. 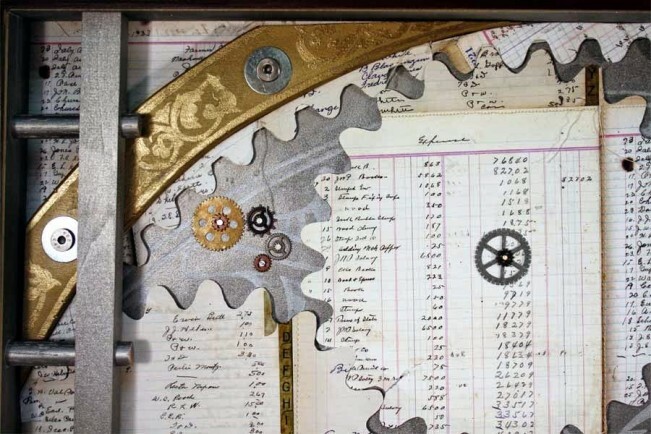 Please make sure you’ve read The Mechanics Of The Chinese Domestic Gold Market, Chinese Gold Trade Rules And Financing Deals Explained, Workings Of The Shanghai International Gold Exchange, and SGE Withdrawals In Perspective. 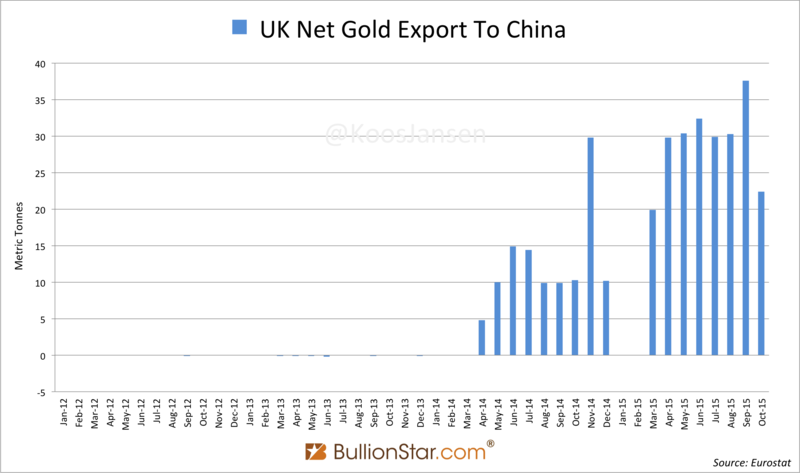 In October the UK net exported 22 tonnes of gold directly to China, which is 40 % less than in September, in the first ten months of 2015 the UK has net exported 233 tonnes of gold to China. Together with Hong Kong (72 tonnes) and Switzerland (29 tonnes) the UK has net exported 123 tonnes to China in October, down 13 % m/m. 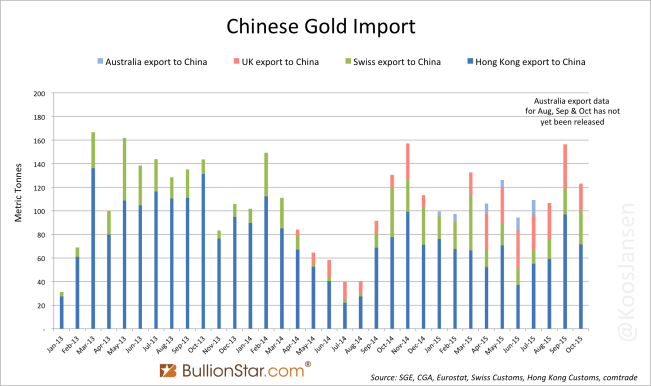 Have a look at the chart below in which monthly gold export from Hong Kong, Switzerland, the UK and Australia to China is shown. 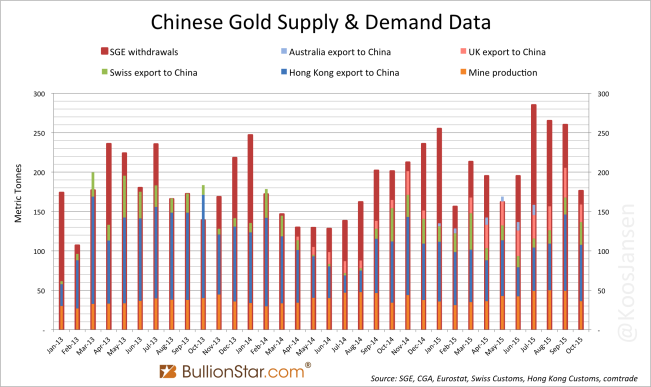 Probably Australia has been exporting gold directly to China in August, September and October, but this data has yet to be released. 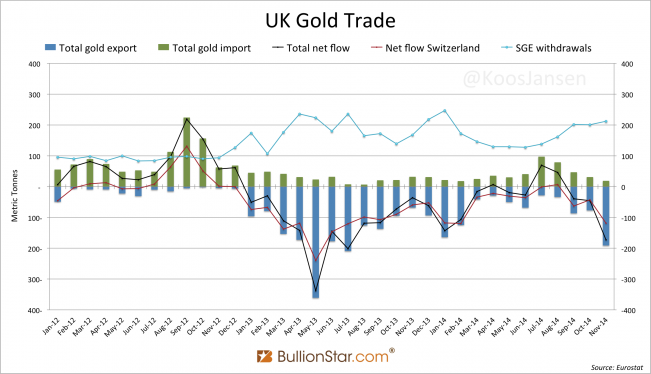 Other countries can also export gold to China but I haven’t been able to access such data – for example, Russia claims to send all gold via Switzerland or Hong Kong to China, and South Africa doesn’t disclose any of its gold export ‘country specific’. 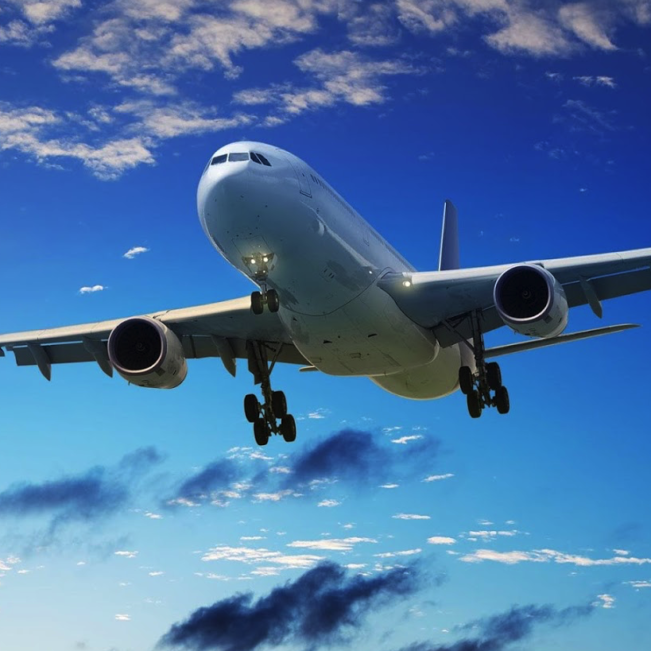 As far as is publicly disclosed the UK, Hong Kong, Switzerland and Australia have net exported 1,152 tonnes to China year to date, which is 1,438 tonnes annualized. 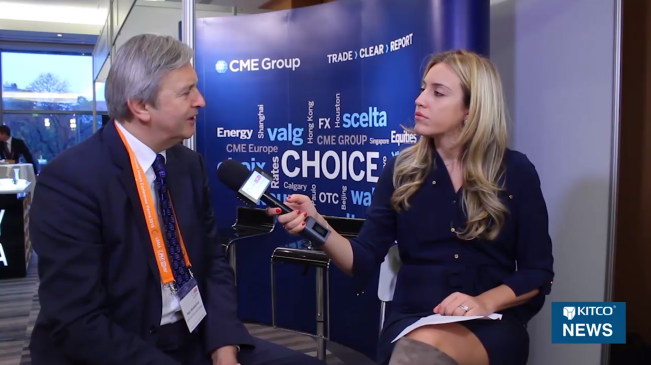 Two weeks ago we discussed the possibility of the Shanghai International Gold Exchange (SGEI) from where gold can be withdrawn out of the vaults and exported abroad. 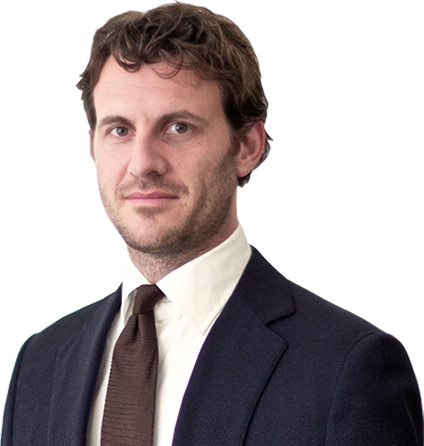 Although the most popular SGEI contract iAu9999 has barely seen any liquidity over the exchange in recent moths, the same contact has shown more activity in the OTC market (15 tonnes have been traded in the Chinese OTC market through iAu9999 in week 47). In theory the gold withdrawn from SGEI vaults can remain in the Shanghai Free Trade Zone, be exported into the Chinese domestic gold market or exported to foreign countries like India. My suspicion was not much is exported abroad, which has been strengthened this week by a Chinese banker that wrote me, “iAu9999 trades are seldom exported overseas, nearly all are imported to the Main Board of the SGE”. So, at this stage we may assume the gold we see being exported from the West to China is not transshipped to other countries in Asia. Put differently, SGE withdrawals are very little distorted by withdrawals from the SGEI vaults. 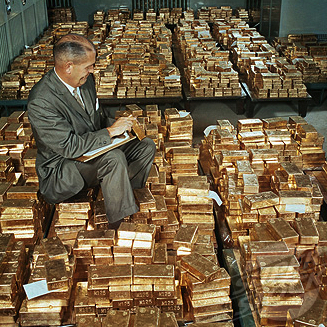 With that argument of the list for now, let’s continue to investigate gold-for-gold supply. As explained in previous posts nearly all import, mine and scrap supply in China is channeled to the SGE. And, by knowing how much was withdrawn from the SGE we can grasp how much was supplied as well. Let’s compare known import and mine to SGE Withdrawals. In the chart above I’ve plotted known Chinese gold import and mine supply versus SGE withdrawals. In this illustration we can see SGE withdrawals have greatly exceeded import + mine in the months of June and July 2015 – the inner bars do not reach the red bars in these months by far. This gap must have been supplied by SGE inventory, unknown import or recycled gold (scrap or gold-for-gold supply). We can also see in the chart that usually after a period of elevated SGE withdrawals comes a period of restocking the SGE vaults. After months wherein there is a large gap between the inner bars and the red bars follow months in which the inner bars reach or transcend the red bars. From this point of view, some of the withdrawals seen last June and July can have been supplied by SGE inventory. However, the gaps between import + mine and SGE withdrawals are widening, suggesting these gaps are increasingly caused by unknown imports or recycled gold. 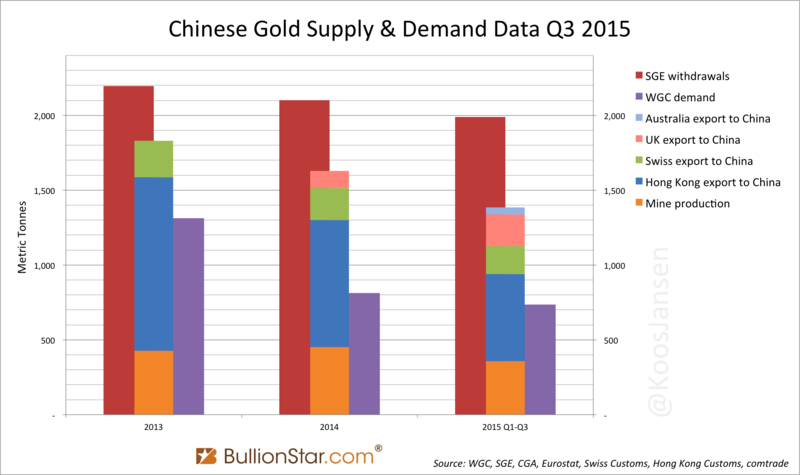 To clarify myself let’s revisit the chart of Chinese gold supply and demand covering 2013, 2014 and Q1-Q3 2015. 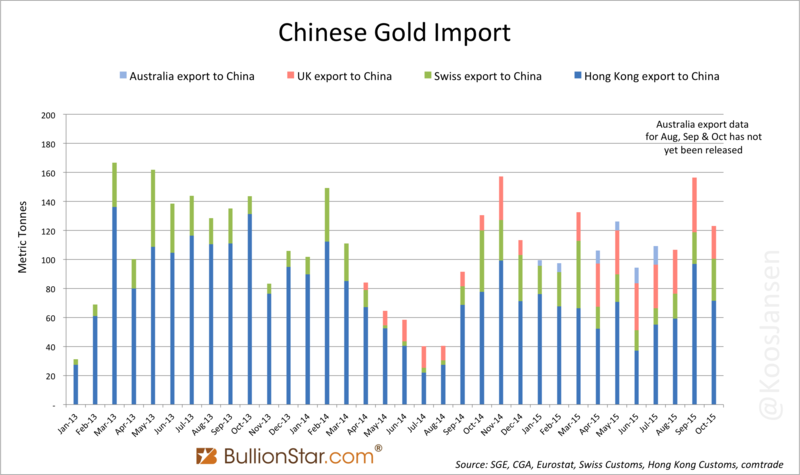 I would like to stress the above chart does not capture all Chinese gold import, but if seen for studying trends we can observe visible (publicly available) Chinese gold import is declining relative to SGE withdrawals. And thus, recycled gold through the SGE has likely increased since 2013. This is what we know at this stage: (Visible) Chinese gold import is set to reach 1,438 tonnes in 2015 and Chinese domestic mining output will be 476 tonnes. 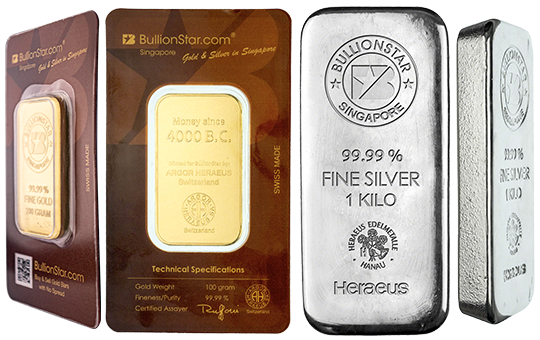 With annualized SGE withdrawals at roughly 2,500 tonnes that makes recycled gold 583 tonnes (2,500 – 1,438 – 476). Of these 583 tonnes not more than 200 tonnes can be conventional scrap supply sold for cash, the rest (383 tonnes) is gold being recycled through the SGE vaults (or is supplied by unknown imports). So, although SGE withdrawals are exceptionally high this year, a little nuance can’t hurt. 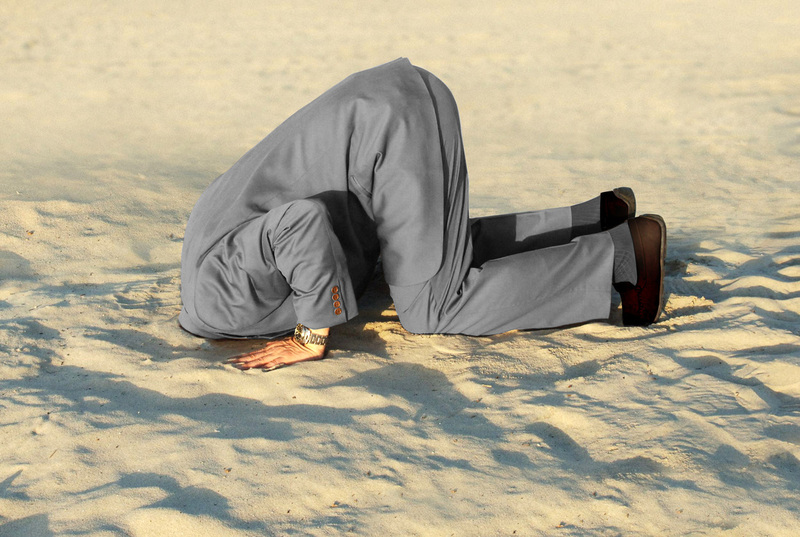 Only until we get the official data from the China Gold Association (CGA) Gold Yearbooks we know for sure what Chinese gold demand was. The Chinese Yearbook for 2014 has been released a few months ago but still I haven’t received a hard copy. 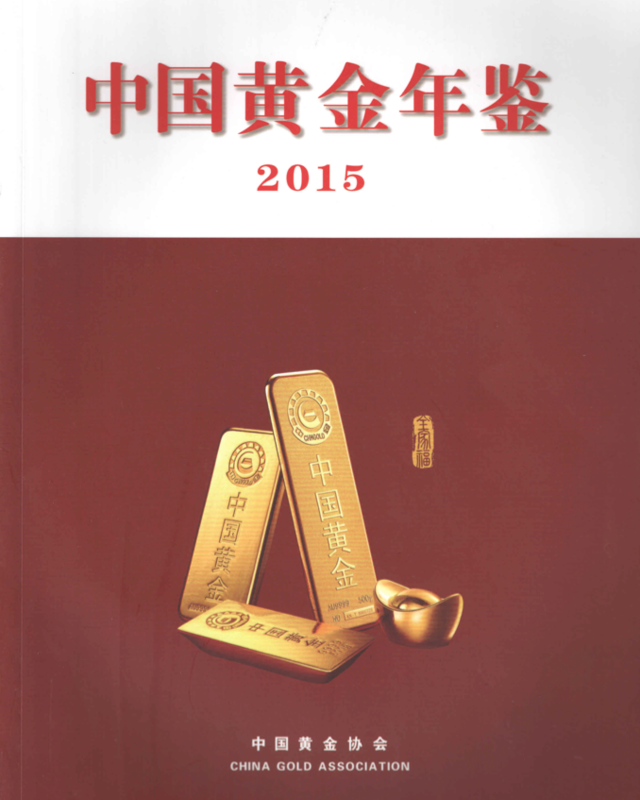 The China Gold Association Gold Yearbook 2015 covers calendar year 2014. In other news, Russia’s Otkritie Financial Corporation Bank has become an SGEI member on 7 December, according to PRIME News. “The approval will allow the [Otkritie] bank to carry out operations at the Chinese market, which is the largest producer and consumer of the precious metal…and to provide the most attractive conditions for purchases of gold bars in Russia,” the bank said. 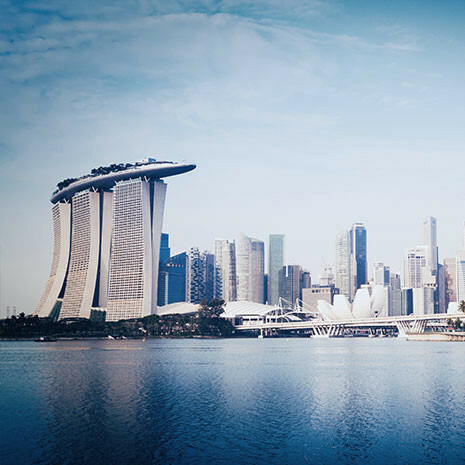 The bank’s vice president, Yelena Magera, told PRIME the SGEI plans to become the world’s center of gold trade by volume, as Asia accounts for the bulk of the world’s demand for gold.